The New York Racing Association Inc., (NYRA), in conjunction with the New York Thoroughbred Breeders (NYTB) and New York State Thoroughbred Breeding and Development Fund (The Fund), announced on Wednesday a dramatic increase in purse values for the New York Stallion Stakes (NYSSS). In 2019, purses for the 10-race series restricted to the progeny of nominated New York stallions and contested on NYRA racetracks will double from $1,150,000 to $2,300,000. Purses for all 10 races will see increases with The Great White Way for juvenile males and the Fifth Avenue for juvenile fillies, to be run at Aqueduct in December 2019, becoming the richest sire stakes races in the country with purses of $500,000 each. Funding for the enhanced NYSSS purse structure comes from The Fund which distributes “Purse Enrichment” annually. The purse hike will directly benefit all participants in the New York breeding and racing programs starting with the owners of New York-sired horses, who already derive added value from the racing opportunities afforded by the NYSSS. Owners will see an increase in their bottom lines both from bigger purses and the opportunity to earn larger “Open Owner's Awards” from The Fund. Currently, New York-sired horses who finish first through third in open races, and races like the NYSSS which are not otherwise restricted to New York-breds, earn 20% on top of purse earnings. a pair of sprints for older horses run at Aqueduct (the Thunder Rumble for males and Staten Island for fillies and mares) will be worth to $150,000 (up from $125,000). Breeders of New York-sired New York-breds and stallion owners will also benefit from the opportunity to earn increased fund awards. New York-sired New York-breds earn 30%, 15% and 15% in “Breeders Awards” for first, second and third-place finishes, which is 50% more than the Breeder's Awards for out-of-state-sired New York-breds. “Stallion Owner's Awards” are allotted at 10% each for progeny that finish first through third. On the bloodstock side, New York-sired foals will gain added value in the sales ring for their increased earnings potential. 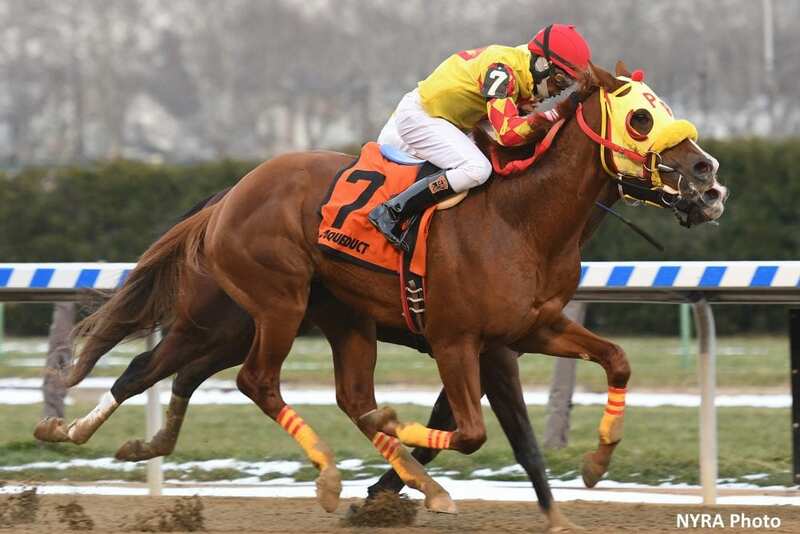 Live racing returns to Aqueduct Racetrack on Friday. The lucrative 23-day fall meet, which runs from November 2 through Sunday, December 2, offers a total of 29 stakes events worth more than $5 million in purse money. Gates open Friday at 11 a.m. with first post time at 12:15 p.m. This entry was posted in The Biz and tagged fifth avenue stakes, Jeffrey Cannizzo, martin panza, New York Racing Association, New York Stallion Stakes, New York State Thoroughbred Breeding and Development Fund, New York Thoroughbred Breeders, nyra, nysss, purse, purse increase, Purses, the great white way by NYRA Press Office. Bookmark the permalink.